Like any proud Lady, a Submarine's weight is a very important matter. Ojibwa was no exception. However, unlike our ladies of the human variety it was not only important to make Ojibwa lighter but also, at times, to make her heavier. And perhaps a little like our ladies of humankind it was important where Ojibwa carried her weight. The weight control issue in Ojibwa was known as trimming the submarine. When she was operating in her element beneath the surface of the ocean it was essential for her to be the same weight as the water she displaced. Like any other vessel, if she was too heavy she would sink to the bottom. But the aim in Ojibwa was to control her depth with movement of water and hydroplanes. Submarine hydroplanes, or planes as they were more commonly called, are a little like stubby airplane wings that can be rotated up or down from within the submarine. More on planes later. There are several factors that complicate the objective of weight equal to the water displaced. First of all, not all water weighs the same. Strange you might say. It doesn't vary much but considering the amount displaced by Ojibwa even a very small variation in the water's weight can be enough to create difficulty controlling her depth. The weight of water can be affected by temperature and depth, but only slightly. The main factor is salinity. Salinity changes the density and density determines the weight. More salt = heavier water. Anyone who has tried to float in fresh water and salt water knows it is easier to float in the salt water. So, the weight of water is a factor. And that factor varies. The size of the submarine, of course, is the other factor. You would think that, once she is built, her size wouldn't vary; but it does. Not by adding bits and pieces to the outside of her hull, but by depth. In other words, the size of the submarine varies by what happens when she dives deep. The pressure of water on submerged objects is powerful. If you have ever swum underwater you have sensed that pressure on your ears. The deeper you went the stronger that pressure got. When designing things to withstand the great pressure of water at great depths, the shape of the object is very important. If it's the wrong shape it will implode, or crush if it was taken deep enough. The sphere is the ideal shape because the water pressure is equal all round. More on submarine shape later. 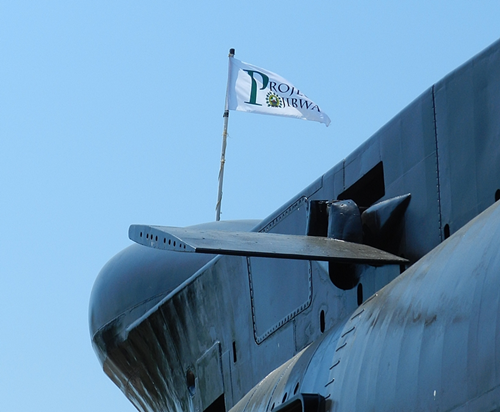 In normal operations, before Ojibwa went to sea, the Engineering Officer would "put on a trim". That is, he considered the weight of Ojibwa and all of her crew and the stores and supplies brought on board. Knowing the weight of water that Ojibwa displaced dived, he compared the two weights. If Ojibwa was lighter, he flooded water from sea into tanks called, what else, trim tanks. And, if she was too heavy, he pumped water out into the sea. By all calculations and water movement in or out, Ojibwa would be the same weight as the water she displaced when dived. I have personally known one or two engineers who could get it close. (Sorry engines, I couldn't resist). Mind your bubble to keep things trim. Once Ojibwa was dived, it would be apparent if the trim was correct or not. A "stopped trim" meant that Ojibwa would stop dead in the water submerged. If she started to sink, she was heavy and water had to be pumped out. If she ascended toward the surface, she was too light and water would be flooded in. That was "catching a trim". At the same time, the Engineering Officer would trim water forward or aft depending upon where she was carrying the most weight. Too much weight forward and it would be difficult to keep her bow up; too much aft and it would be hard to get the bow down. Both of those conditions would now become large factors when trying to maintain depth with speed and hydroplanes. When considering the two main factors, salinity and depth, you must remember that the trim is only correct for a particular depth, temperature and salinity. Great caution had to be exercised in covert harbour operations where the water salinity and temperature can be seriously affected by fresh water rivers flowing into it. Running from salt sea water into a flow of fresh water could have the submarine bouncing off the bottom and then broaching into view on corrective over reaction. That it would not look good in the mission report was not as much worry as being attacked by the military on whom we were gathering intelligence. When Ojibwa went deep she would actually get smaller as the water pressure squeezed her pressure hull. If a piano wire was tightly strung from port to starboard inside of her at periscope depth (55 feet), it would become slack and sag at 500 feet. In effect, she was squeezed smaller, and therefore displaced less water. She was still the same weight but was displacing less water, so in effect heavier and water had to be pumped out to make her lighter. The reverse was true when she would return to periscope depth. If that piano wire was strung tight at 500 feet, it would probably snap on the way up as the ocean's water pressure became less. "Engine Room Control, Pump 100 gallons". The water would be pumped by the ballast pump. "Engine Room Control, Flood 50 gallons." When all of the stokers and electricians who live back in the after torpedo room came forward to torment the important operational people living forward, Officer of the watch (OOW) to the panel watch keeper: "Flood 500 gallons aft" and that might correct the weight distribution in the submarine. 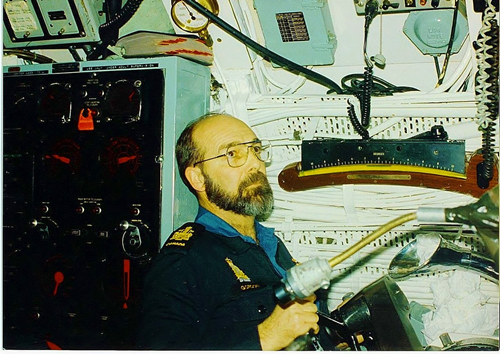 So, next time you hear someone speak of trimming their house for Christmas, crack a little smile and think about how submariners trim their submarine. 'Lucky' at the helm - the One Man Control - surfacing an O-boat for the last time before he left for a stint on skimmers.